Arsene Wenger believes Robert Pires' insecurity led to the oddest penalty ever seen in the Premiership as Arsenal beat Manchester City 1-0. 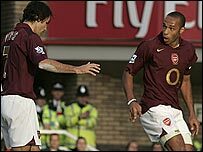 Pires, who had scored one penalty, tried to set up Thierry Henry with his second spot-kick but scuffed the pass and conceded a free-kick instead. Wenger said: "Robert was uncertain and scared to miss the penalty and he made a big mistake and a wrong decision. "He was not lacking seriousness or respect - he was lacking confidence." Wenger revealed that Pires explained how he and Henry had decided to play the penalty between them. The pair had practised the ploy in training, one used by Dutch legend Johan Cruyff when he exchanged passes with team-mate Jesper Olsen before scoring for Ajax in the 1982-83 season. But it went horribly wrong for the two Frenchmen and has led to accusations that the attempt was disrespectful. However, Wenger insisted: "It could be interpreted that Robert was being disrespectful, but that would be wrong. "I think it is because he is so serious that he was insecure about taking a second penalty. "I felt Robert had enough confidence to take the second penalty, but that is not the way he felt. "I felt disbelief. But Robert is a lucky boy because the team has not been punished." Doesn't Pires want a new contract offered to him? He's going the right way about it! As a result of the incident, Henry has declared "I will now take the penalties - all of the time", having previously passed had he been the player fouled. And he added: "I take all the blame, it was my idea. If it had worked it would have been a brilliant idea, but it did not work. "Robert's leg went numb, but had he touched the ball, I would have been there to bury the ball. "I want to apologise to Arsenal fans because maybe it was not the right thing to do. "It was not a lack of respect - maybe we should not have done it, but football is a game and it is entertainment."